A special air surrounds work executed by four hands, and in the street art tradition, this is not so uncommon. When the fact that the four hands belong to a couple of twins is added, the magic is all the more powerful. 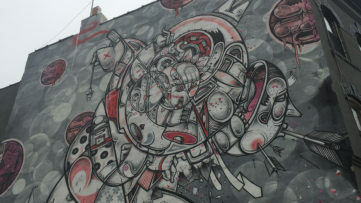 How and Nosm make another team of twin painters, who have been working together for a long time. They created a recognizable style with an abundance of detail, which originated in the street, but now is successfully, though not entirely, transferred to studio. 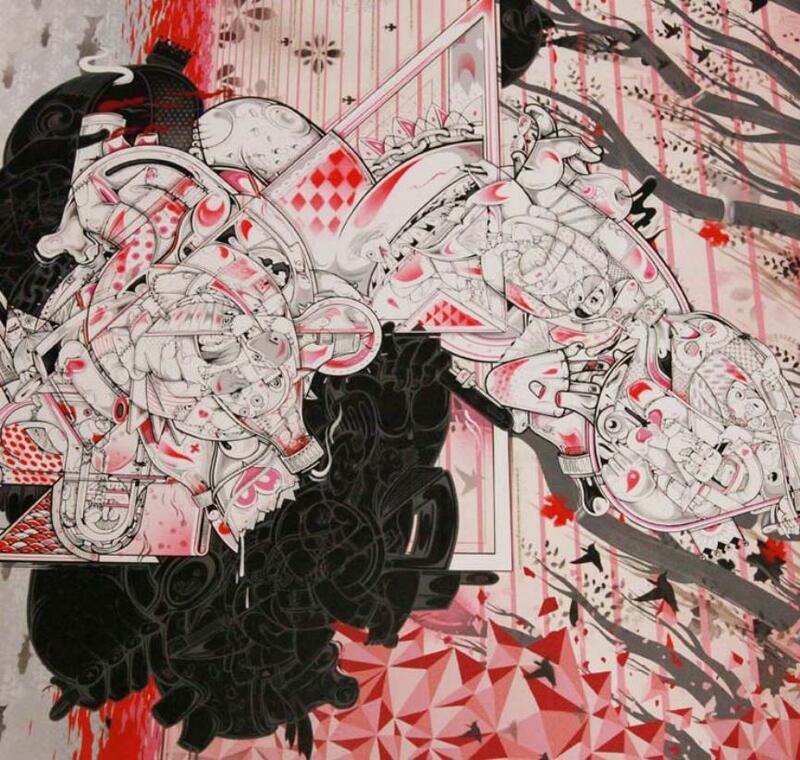 New York space Pace Prints announced an exhibition by the twin artists titled Way Things Are. 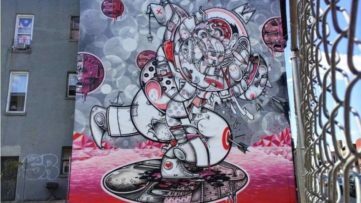 The show will present the latest hand-painted monoprints, featuring their unique expression for the first time with the said gallery. Way Things Are is scheduled to open TODAY, March 6 at 6 pm, and it will be on view through April 7, 2014. Raoul and Davide Perre have prepared all new body of work for the Way Things Are exhibit at Pace Prints. 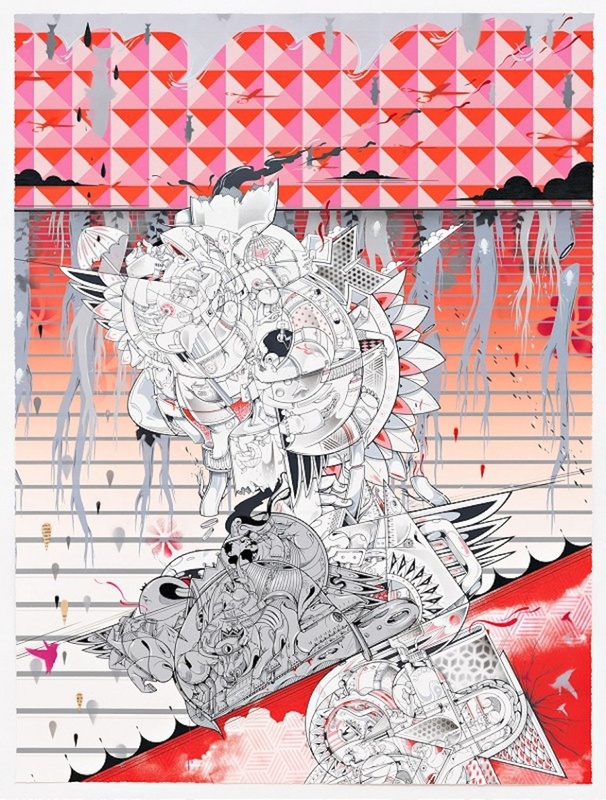 It will be comprised of unique works on paper, produced through sikscreen printing process combined with hand painting. 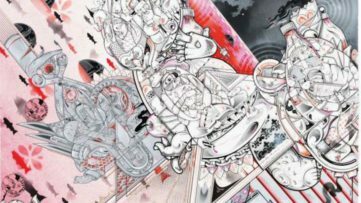 Conceptually, the works are based on everlasting exploration of the mundane, while seeking the diversity in repetition. The large monoprints will actually pay an homage to the inevitable routines of the everyday, which, as the artists see it, must be accepted first, in order for the individual to move on and break the rhythm of the monotony. 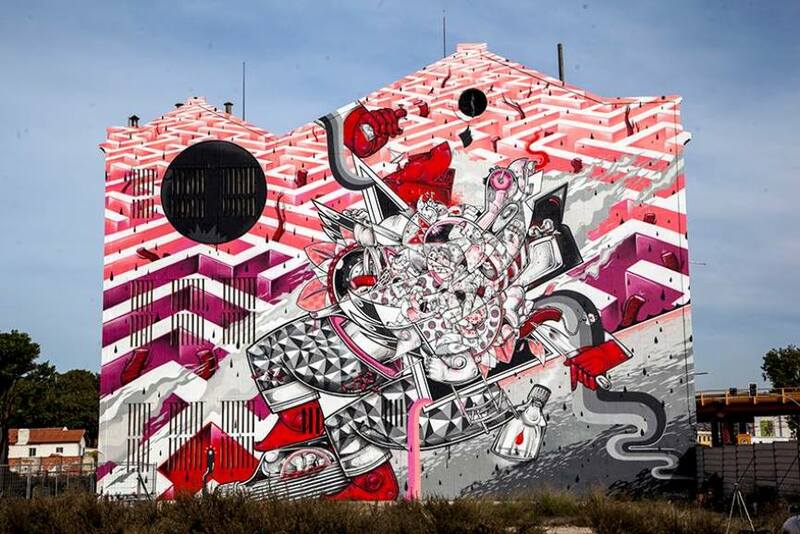 How and Nosm style is characterized by the endless intertwining patterns, shapes-shifting forms and geometric elements, which all make their unmistakable visual language. All the works are abundant in detail, representing countless strata of meaning, and contributing to the elaborate narrative. The palette of the duo is reduced, but it serves the expression. It encompasses shades of black, red and white, each varying in intensity to support the main story. Central shapes are repeated, but oriented differently throughout the painted area. Initially, each of the pictorial elements appears as unique, but when looked upon closely, the viewer is stricken with the amount of repeated subjects and the way they are composed, lit and painted. These seemingly non-existent, but very much repeated leitmotifs echo the daily routines, which make the inspirational foundation for How and Nosm in this series of monoprints. The twin duo of aerosol muralists and printmakers, How and Nosm have an interesting background, as they were born in the Basque capital of San Sebastian, and afterwards having grown up in Duesseldorf, Germany. They started playing with spray paint as teenagers, tagging around their town. At the end of the 1990s, they moved to New York, and starting from virtually nothing, they are today successful artists. They were members of the notorious Bronx graffiti group called TATS CRU. The work of Raoul and Davide Perre can be seen around the world, as they have been summoned to many countries to produce large murals. They painted walls in Portugal, Brazil and different US cities. 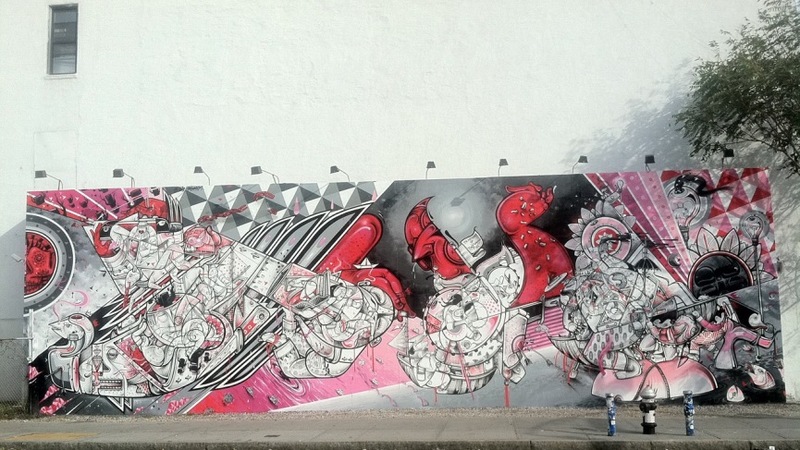 How and Nosm have transferred a part of their work to studio, while still are very much active as street artists and muralists. 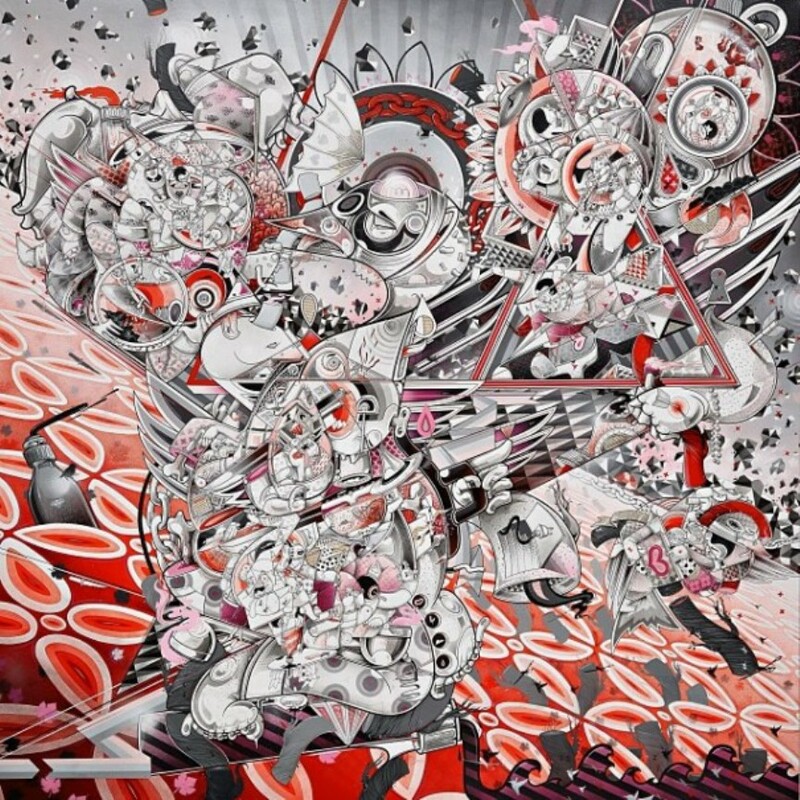 Their style is widely recognized as for its abundance of detail, erudite graphics and singular use of color.